Save My Heritage Initiative (#SMHI) is a platform created by Badan Warisan Malaysia to extend our message of heritage appreciation and conservation and to promote the significance and value the tangible and intangible cultural heritage of Malaysia. Working with cultural practitioners, heritage professionals and educators, #SMHI will introduce a varied programme with opportunities for people of all ages from school children, students, academics, professionals and the general public to participate in, and enhance their understanding and knowledge of our heritage. Activities will include talks and lectures, walks and visits to heritage places, training workshops, seminars and events for a wide audience to better understand and be involved in caring for their heritage. Badan Warisan Malaysia has been championing our nation’s built and cultural heritage since 1982. Our role has been that of a civic trust, building preservation advocate, heritage consultancy and charitable institution with the mission to Educate, Engage and Empower our fellow Malaysians. To complement and amplify our objectives we will soon launch a new website called SAVEMYHERITAGE.ORG which is an informative and interactive platform where the public can identify heritage assets under threat and generate support for them. The series of talks and live presentations around the theme Save My Heritage will kick off on 30 July 2016 with Restoring Fort Alice by Ar. Mike Boon. This entry was posted in Save My Heritage, Uncategorized and tagged Architecture, badan-warisan-malaysia, Buildings, discoverywalk, heritage, heritage walks, kuala lumpur, savemyheritage, walks & talks. Many architectural heritages look back at a long and complex history. For example, during the colonial history, the old town of Malacca had been changed in particular by the Portuguese and by the Dutch. These spatio-temporal changes of buildings and other built in structures as well as man-made environmental modifications are documented in cartographic works (maps and map like illustrations), old paintings and drawings, as well as historical documents such as books, diaries, treaties, letters and charters. They involve not only changes of building geometries, but also semantic alterations as property owner, building usage, etc. But how can we make this information adequately understandable by the general public? A visual 3D representation of such evolving information can be one of the most appropriate and effective methods to communicate this history. This talk by Dr Stefan Peters will highlight 3D modeling and reconstruction approaches for spatial heritages, choosing roman cities (Noma, Neapel, Nemi) and the historical town of Malacca as study cases. A special focus will be on procedural modeling, 3D cartographic web rendering, reconstruction uncertainty, and geocoded images in 3D. The presentation demonstrates technical perspectives and limitations. Holding a PhD in Cartography, a Diploma Engineering Degree in Geodesy and Geoinformation, and a professional ‘Surveying and Catastre’ training certificate, Stefan Peters has a strong educational background in geographic data acquisition, geodata modelling, database management, data analysis, information retrieval, and cartographic visualization including web mapping. With over 15 years of working experience in the field of Geomatics and Geoinformatics, specialising in geospatial data analysis and visualization, he has actively participated in various projects related to geological, land cover, land use, atmospheric and climate applications. Dr Peters was Senior Lecturer at the Department of Geoinformation at the Universiti Teknologi Malaysia (UTM) until May 2016. Prior to that, he was a Research Associate at the Department of Cartography at the Technische Universität München (TUM) for more than six years where he was involved in several diverse GIS and Mapping projects as well as research activities. In addition to his teaching responsibilitieshe hwas coordinated and supervised a project related to an excavation in Italy including geodata acquisition, GIS-modelling, visualization of archaeological findings, and the 3D visual reconstruction of antique assemblies. This entry was posted in Talks & Lectures and tagged 2 Jalan Stonor, Architecture, badan-warisan-malaysia, Buildings, History, kuala lumpur, presentation, talk, walks & talks. The discovery of these old batu nisan in the vicinity of Masjid Jamek is incredibly exciting as it is clear, tangible and unarguable evidence of the historical timeline of the development of this city and its early Muslim settlement at the trading post which is now this modern metropolis. The fact that several other type of artefacts such as ceramic bowls, glass and other items have also been found makes it even more imperative that a proper and systematic methodology for detailed mapping of the ground below in the whole area surrounding the mosque be undertaken immediately, before the area is disturbed further. Publicly sharing all such recording and documentation by historians and archaeologists will provide a rich picture of the social and cultural lifestyle of these early settlers and ultimately help create a better understanding and appreciation of the many different people and communities which were the backbone on which this city was founded. Whether the batu nisan were found is within or outside of the boundary of the gazetted National Heritage Site of Masjid Jamek, should not be an impediment because the National Heritage Act 2005 gives the Heritage Commissioner the authority to stop work if it is deemed that items of national heritage significance will lost or negatively affected by this work. The area where the batu nisan have been found is definitely within the larger historic enclave where the majority buildings have been gazetted on the National Heritage Register. While completing a new water fountain feature within the River of Life project is clearly important to the aspirations of the city’s authorities, a comprehensive multi-disciplinary study of this site is even more important to the city and its citizens. In many parts of the world, showcasing historical and archaeological investigations at such urban sites provide a “crowd-pulling” platform for locals and visitors alike. Cordoning off this area will more than anything likely enhance the attraction of the site and its surrounds. Badan Warisan Malaysia hopes that the National Heritage Department will step up to the mark and lead in this research to ensure that the heritage value of this site is given its due recognition. This entry was posted in In The News, News & Events, Opinions and tagged Architecture, badan-warisan-malaysia, Buildings, History, kuala lumpur. Come dressed comfortably, wear your hats, umbrellas and comfortable shoes. It’s going to be a wonderful morning exploring the city! This entry was posted in News & Events, THIS KUL CITY and tagged badan-warisan-malaysia, Buildings, History, kuala lumpur, Malaysian Heritage Trust, ThisKulCity, walks & talks. 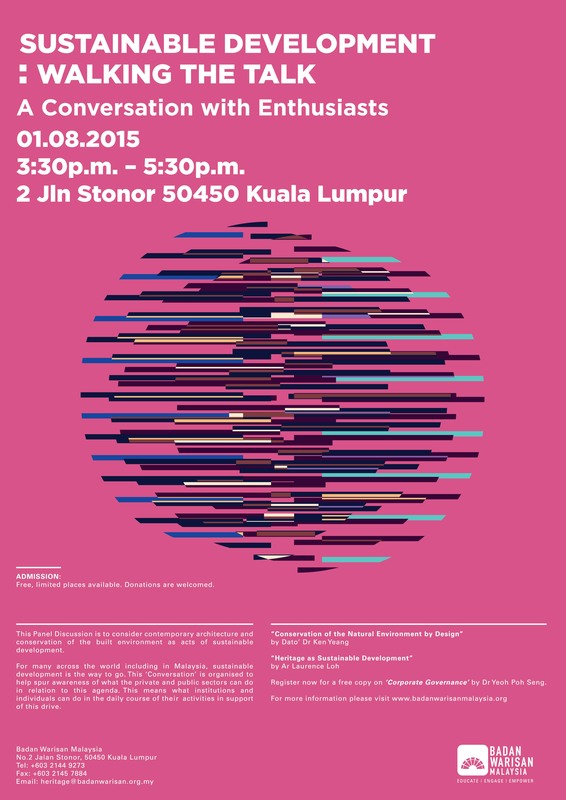 Badan Warisan Malaysia is hosting a talk on Sustainable Development: Walking the Talk on Saturday, 1 August 2015. This talk will feature Dato’ Dr. Ken Yeang who will be speaking on ‘Conservation of the Natural Environment by Design’ and our President, Ar. Laurence Loh will be speaking on ‘Heritage Sustainable Development’. Participants will be given a free copy of a new book by Dr Yeoh Poh Seng on Corporate Governance which contains a chapter on governance in the Civil Society Organisation’s sector. Admission is FREE but places are limited. Donations are welcomed. Click below to register. Ken Yeang is an architect, masterplanner and ecologist who is best known for his signature ecoarchitecture and ecomasterplanning buildings and projects, that have a distinctive verdant green aesthetic. He trained at the AA School (UK) and received a doctorate (PhD) from Wolfson College, Cambridge University (UK). He is principal of Hamzah & Yeang (Malaysia) with offices in UK and China– its expertise is in delivering deep green, innovative ecological architecture and masterplans that go beyond conventional green accreditation systems. He is the Distinguished Plym Professor (Illinois University). He has authored over 12 books on green architecture and has received numerous awards including the Aga Khan Award for Architecture, the Prince Claus Award, the Malaysian Institute of Architects Gold Medal, the Malaysian Government’s Merdeka Award. Laurence Loh- President. Laurence is a leading conservation architect and cultural heritage expert in Malaysia and the Asia-Pacific region. His conservation work has won many UNESCO Asia-Pacific Heritage Awards. With Badan Warisan Malaysia, he participated in drafting the Conservation Management Plan for George Town as part of the World Heritage Dossier. This entry was posted in News & Events, Talks & Lectures and tagged 2 Jalan Stonor, Architecture, Buildings, heritage, Laurence Loh, sustainable development, talk.